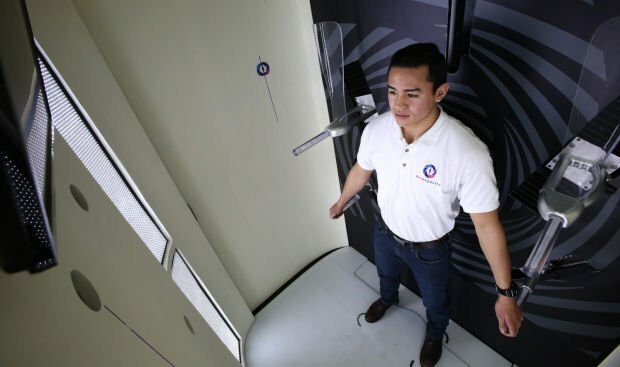 Mechanical engineering intern Nathan Santana demonstrates one of the standing positions inside a Automated Total Body Imaging System, which uses nine cameras to detail all parts of the body. A screen tells Santana how to position himself. Using this monitor, a nurse operating the Automated Total Body Imaging System can capture and preview images. DermSpectra, a Tucson-based startup at 2601 N. Campbell Ave., developed the high-definition body imaging device. 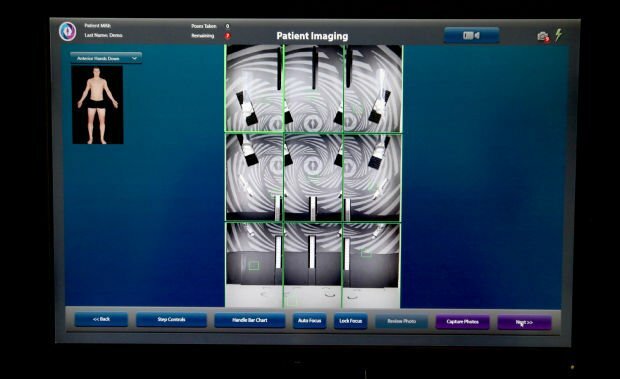 A screen tells patients how to position themselves for DermSpectra’s imaging system, which allows allows doctors and patients to monitor changes in lesions and keep track of skin growths. The company aims to place the units in clinics and hospitals. DermSpectra is a Tucson-based company trying to bring dermatology into the 21st century through its automated total body imaging system. Founded in 2011 by Karleen Seybold, chief executive officer, and Dr. Clara Curiel, chief medical officer, the skin cancer imaging company aims to provide a standardized approach to total body imaging for medical practices and clinical trials. “What we’re looking to do is to fill a gap in the dermatological field of skin cancer documentation,” said Curiel, a dermatologist, researcher and skin cancer and pigmented lesion expert at the University of Arizona. Despite skin cancer being the most common form of cancer in the United States, there are very few tools for standardized screening, early detection and documentation at the full body level. Curiel said that 99 percent of the time you go to a dermatologist, the dermatologist will perform a partial or full skin examination and they’ll write down what they see. They might take a snapshot of a small area of skin, but not every dermatologist does. Imaging is the best way to keep up with where spots are and exactly what they look like at the time of a clinical evaluation, said Dr. James Sligh, chief of dermatology at the University of Arizona. “Once someone has done a biopsy, that spot is forever changed and it’s difficult for downstream providers to get that original assessment,” Sligh said. The DermSpectra Automated Total Body Imaging System, which is registered as an FDA class 1 device, allows for total body imaging to be completed in just seven minutes. Patients disrobe and step into the imaging booth, where an instructional video will demonstrate the nine different poses as cameras take high-definition pictures, which can easily be viewed electronically. Seybold, a former engineering manager at Raytheon, said one of the biggest barriers to using photography or images in dermatology is the lack of an efficient and portable application on which to quickly view and annotate the images. As a result, DermSpectra also developed a viewing application that can be accessed on an iPad or computer. Physicians can then annotate the image, adding comments and a diagnosis. This information can be saved to the image file and stored in an electronic health record or converted into a pdf file with a summary. Practices differ in their equipment and methods; they have different cameras, picture formats, use different angles and illumination. Until now, Curiel said total imaging has been seen as something that’s done for patients that have a high risk of developing melanoma. Patients typically go to a medical photographer to have full body images taken, but that can cost $400 to $500. DermSpectra placed beta units at its offices in Tucson and Scottsdale in 2014. They charge $200 per imaging session, which includes the patient getting a copy of their own images and a copy sent to their physician. However, the company’s primary business model is to place the imaging system in practices, clinics and hospitals so patients have full access. It costs around $180,000 for the full system, which includes the imaging station, server, database and the application for imaging. It is also looking into leasing the imaging stations so practices, clinics and hospitals can pay on a per-scan basis. Seybold said the company’s flexibility with its business model is an attempt to drive adoption in the market. “Our goal would be, in the future, that everyone has a total body skin scan in their medical record so they can track their skin over time so they can detect cancer early,” Seybold said. DermSpectra also has a unit at the Mayo Clinic Center for Innovation in Scottsdale, and is working hard to get units installed at large institutions across the country. “Standards usually start at large institutions and then trickle down into the community,” Curiel said. In 2011, DermSpectra received a Science Foundation of Arizona Grant, though now a private investor funds it. The company recently received a $300,000 grant from the Veterans Administration hospital, through Emory University, to begin skin imaging for its telemedicine program. The company is also looking at getting involved with clinical trials as pharmaceutical companies. Kayla Samoy is a NASA Space Grant intern at the University of Arizona and the Arizona Daily Star. Contact her at ksamoy@tucson.com. On Twitter: @kaylasamoy. Southern Arizona's rate of melanoma, the most serious type of skin cancer, is well above the national average — one in 38 local residents will be diagnosed in their lifetime, statistics show. Sun exposure is the biggest risk factor, particularly in people who have had a lot of sun exposure and sunburns as children and teens. Other risk factors are genetics and fair skin. Warning signs include moles that are changing, a sore that bleeds and doesn't heal, and rough spots on sun-exposed areas. DermSpectra charges $200 per imaging session at its Tucson office. There is no referral necessary. A person can schedule an appointment on the company's website and DermSpectra will provide a set of images to the patient and their physician. "This is part of our 'know the skin you're in campaign' aimed directly at the patient," said CEO Karleen Seybold.